In 1-quart saucepan, mix 1/4 cup of the whipping cream and the coffee. Cook over low heat, stirring constantly, until mixture simmers; remove from heat. Using wire whisk, stir in chocolate chips until melted. Stir in vanilla. Pour into medium bowl; cool until room temperature, about 10 minutes. In another medium bowl, beat remaining 3/4 cup whipping cream with electric mixer on high speed until soft peaks form. Refrigerate half (about 3/4 cup) whipped cream for garnish. Fold remaining whipped cream into chocolate mixture. Cover and refrigerate 30 minutes. Heat oven to 375°F. Unroll dough on work surface; firmly press perforations to seal. Using ruler, push dough into 10x7-inch rectangle. Cut into 24 squares, 6 rows by 4 rows. Place 1 inch apart on ungreased cookie sheet. In small bowl, beat egg and 2 tablespoons powdered sugar with fork. Brush on tops of squares. Bake 8 to 10 minutes or until puffed and golden brown. Cool completely, about 10 minutes. Just before serving, spoon about 2 tablespoons chocolate mixture on 12 of the crescent squares. Place remaining crescent squares on top. 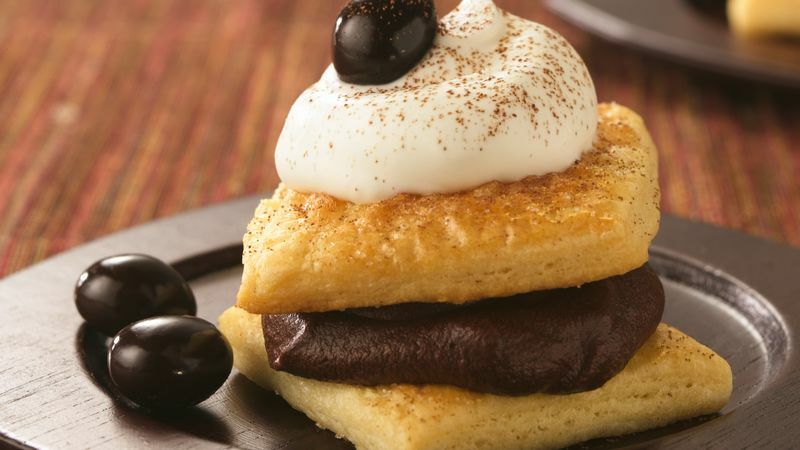 Top each with about 1 tablespoon reserved whipped cream and 1 chocolate-covered coffee bean. Measure 1 teaspoon cocoa into fine mesh strainer. Sift cocoa over tops of puffs. The whipping cream, filling and puffs can be made ahead, but wait to assemble the dessert until just before serving or the puffs will get soggy. For a less intense coffee flavor, use regular coffee granules instead of the instant espresso granules. I once heard that you should cook with wine you like to drink, not cooking wine. I figure it’s pretty much the same with chocolate – use the type of chocolate in your baking recipes that you like to eat, especially if the chocolate plays a big role in the recipe. What type of chocolate you like best is a matter of personal taste. People who prefer dark chocolate like its sharp taste that leans a little toward bitter rather than sweet. Milk chocolate fans enjoy the extra sweetness that the added sugar and milk lend. And white chocolate offers a completely different taste and texture, often coating other forms of chocolate or surrounding nuts in recipes like almond bark. The difference between the chocolate types is in the proportion of cocoa butter, cocoa solids, and added ingredients such as sugar and milk solids. Milk chocolate and dark chocolate both contain chocolate liquor made from the cocoa solids and cocoa butter found in cocoa beans (not to be confused with chocolate liqueur, which contains alcohol). Dark chocolate contains a larger proportion of chocolate liquor and little or no milk solids, so it has a more intense color and deeper flavor. Milk chocolate also has cocoa solids and cocoa butter, but it has milk and sugar added (which contributes to its lighter color). White chocolate doesn't contain cocoa solids, so some people don't consider it to be chocolate at all – or at least not in the same sense as dark chocolate and milk chocolate. But white chocolate chips are a fun addition to brownies or layer bars, and melted white chocolate makes a great candy coating for truffles or pretzels. What's your fave: white, milk or dark chocolate?